Keeping canned chicken stock on hand is not realistic for our small pantry (besides I don't often use the whole can when cooking and the leftover goes to waste.) So I keep bouillon cubes in stock for when recipes call for it. I've never tried this pasty chicken base until now and like the bottle says -- it's better than bouillon. 1 tsp = 8 oz. chicken broth which is more or less what I usually need. 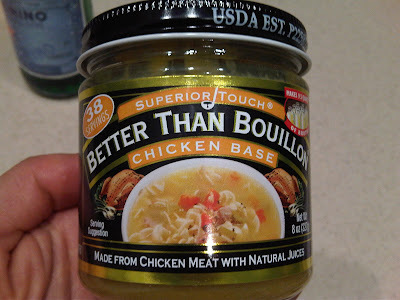 I'm never going back to the powdered chicken bouillon again.